The Nourish team is deeply rooted in education, media, sustainability, and social change. Kirk is the founder and executive director of WorldLink, a nonprofit organization dedicated to education for sustainability. A filmmaker, educator, and social entrepreneur, Kirk has produced award-winning television, interactive multimedia, websites, museum exhibits, and educational curricula. In addition to Nourish: Food + Community, he directed the PBS special Power Shift: Energy + Sustainability and Spaceship Earth: Our Global Environment, winner of two national Emmy Awards. Kirk enjoys tasting seasonal fare at the farmers market and cooking up fresh veggies picked from the garden. With a background in education and urban studies, Elizabeth is a graduate of the University of Pennsylvania and received her master’s degree in Equity and Social Justice in Education from San Francisco State University. For the past eight years, she has worked as a teacher in a Montessori school, where she created an edible school garden and a corresponding food literacy program. She has experience working with nonprofits and educational programs around the country and abroad in the fields of policy, research, and sustainability education. Elizabeth is an avid photographer, enjoys running and hiking, and spends most Saturday mornings with her husband at the farmers market. Chandra is a filmmaker, educator, and health coach. She spent ten years as a producer of award-winning films and television in New York, most recently serving as the environment and health producer/reporter for the series Dan Rather Reports. Chandra left the Big Apple to earn a graduate degree in environmental science from Yale University, where she pursued her passion for food, health, and sustainability education. Chandra also has completed a certificate in nutrition and health counseling, consulted on farm-based education projects, and worked on an organic farm. A recent transplant to San Francisco, she spends her free time exploring the Bay Area’s redwoods, beaches, farms, and vineyards. 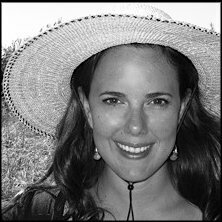 After ten years as a nonfiction book editor specializing in cookbooks and sustainable living titles, Brie left publishing to apprentice at an organic vegetable farm, where she managed the farm’s CSA program. She’s currently Online Education Manager for the Center for Urban Education for Sustainable Agriculture, which operates the Ferry Plaza Farmers Market in San Francisco. Brie enjoys making her own yogurt and nurturing a scrappy container garden on her foggy apartment deck. Jean has been designing graphics and graphic illustrations for over 20 years. Prior to starting her studio in Oakland, California, Jean worked as an art director in Chicago, Tokyo, and San Francisco. Her work includes branding and product identity, printed materials, packaging, exhibit design, and product design. Jean received an MFA in Graphic Design from Rhode Island School of Design in 1985. Jean loves traveling, vegetable gardening, seed saving, and concocting chutneys, salsas, and spice and herb blends from unusual ingredients. She created the Nourish logo, inspired by seeds and growth. Through his Montreal-based web development firm, Example7, Otis transforms designs into visually elegant websites and online communications. Since 1995, he has created websites for small businesses, nonprofits, corporations, local entrepreneurs, musicians, artists, and individuals from all walks of life. When not building websites, he produces commercial and freeform music. Otis buys local and organic as much as possible, loves to cook at home, and smiles a lot, as he believes smiling is the key to a long life.